Hanoi - In commemoration of the International Day of Solidarity with the Palestinian people (29th November), the Embassy of the State of Palestine in Vietnam, the Hanoi Union of Friendship Organizations and Vietnam National Library co-organized a ceremony on 14th December 2016 in Hanoi. The International Day of Solidarity with the Palestinian People is declared and observed by the United Nations on or around 29 November each year. This day has traditionally provided an opportunity for the international community to focus its attention on the fact that the Question of Palestine remained unresolved and that the Palestinian people are yet to attain our inalienable rights as defined by the General Assembly, namely, the right to self-determination, the right to national independence and sovereignty, and the right to return to our homes. Given the on-going non-violence resistance of Palestine, The International Day of Solidarity with the Palestinian People has a growing importance to create an international pressure to end the illegal occupation of Israel. 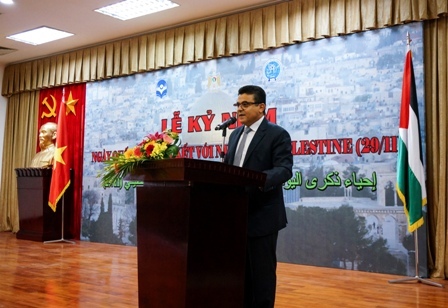 In his speech at the ceremony, Mr. Saadi Salama, Ambassador of the State of Palestine to Vietnam, extended the profound gratitude to all States that have recognized the State of Palestine, the United Nation agencies, civil society organizations, non-governmental organizations and to all brothers and friends and all freedom and peace loving peoples across the world, as well as the friendly people of Viet Nam, who have stood by the side of the Palestinian people in their legitimate struggle for independence and freedom. The Ambassador said that the year 2017 will mark 100 years from the Balfour Declaration of 1917 and the 50th anniversary of the Israeli occupation of the West Bank, including East Jerusalem, and the Gaza Strip in 1967 and leading to the 70th anniversary of the the catastrophe of Nakba. “We stress that the illegal Israeli practices and policies of settlement construction and expansion on the land of the State of Palestine are entrenching a one-State reality, instead of consolidating the pillars of just and lasting peace, based on United Nations resolutions and the Arab Peace Initiative. Furthermore, bringing about a solution to this conflict will help remove pretexts used by extremists and terrorist groups thus contributing to spreading peace and security in the region for the sake of all its peoples.